Welcome to Fairfield Highlands Baptist Church. A marvelous work of God's grace continues in the Fairfield Highlands Baptist family. We have been wonderfully blessed for 90 years of ministry and continue as the lighthouse of Western Jefferson County. With the new millennium comes new challenges for us as the Body of Christ. However, our task remains the same. We will endeavor to reach and touch people for the cause of Christ. We will also seek to maintain the highest standards with regard to spiritual growth and personal discipleship. God bless you all . . . and stay focused on Him. For prayer requests, call the church office on Sunday mornings after 9:30am. The latest edition of the Messenger is available at http://church.fairfieldhighlandsbaptist.org/messenger. Video and photos from Harry's 90th birthday are at http://www.fairfieldhighlandsbaptist.org/harry90. Video of his testimony on his 92nd birthday is at https://www.youtube.com/watch?v=y05JsaGLWl4. Video of his funeral service is at https://www.youtube.com/watch?v=XLWCBo_nWEE. 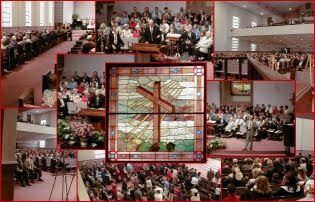 Watch videos of our services and see other news on our Facebook page at http://www.facebook.com/fairfieldhighlandsbaptist. Also see our videos on our YouTube page at http://www.youtube.com/user/fairfieldhighlandsbc and our photos on our Picasa page at http://picasaweb.google.com/fairfieldhighlandsbaptist. Follow us on Twitter @fhbc.